Stratford Butterfly Farm welcomes new residents for Easter! The Stratford-upon-Avon Butterfly Farm is welcoming some new residents in time for the Easter holidays. A number of Mexican Walking Fish, called Axolotls, have taken up residence at the UK's largest Butterfly Farm. Resembling a cross between a fish and a lizard, the Pokémon character "Wooper" has been designed to look like an Axolotl! They are unusual amphibians as they do not complete metamorphosis. If, on rare occasions metamorphosis is complete they become Mexican Fire Salamanders. Rather than developing lungs and taking to land, they remain aquatic and have external gills. Other new arrivals inhabiting Minibeast Metropolis include an Orange Baboon Tarantula which originates from Africa and is commonly known as an OBT or Orange Bitey Thing! Also on display is a Pumpkin Patch Tarantula which is normally found in the rainforests of Belize and a number of beautiful Sungazer lizards, so called as they like to bask in the sun giving them the appearance of gazing into the sun. Also at home in Minibeast Metropolis is the amazing leafcutter ant colony which is one of the largest on display in the UK. Jane Kendrick, Marketing Manager at Stratford Butterfly Farm said "Whatever the weather a visit to the Butterfly Farm is a unique and spectacular day out. You can walk amongst some of the world's most beautiful and colourful butterflies in a rainforest environment with waterfalls and fish-filled pools. 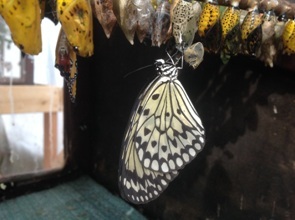 You may even see a butterfly hatch from its pupa in the Emerging Cage!" From 10 - 21 April children and adults can get close to some amazing creatures with 'Meet the Minibeast' handling sessions under the supervision of the friendly and informative Education Team in the Discovery Zone. Visitors will be able to hold a variety of stick insects, African land snails, giant millipedes and even Madagascan cockroaches! To see hundreds of spectacular butterflies, insects, reptiles and spiders visit the Butterfly Farm from 10am to 6pm (last entry 5:30pm) every day of the week. For more information including admission prices and group rates, please visit the website at http://www.butterflyfarm.co.uk or telephone on 01789 299288.